Angela Hartnett, MBE, is one of the UK’s most-loved chefs and restaurateurs, known for her sophisticated, simple, Italian-inspired cooking. Her passion for honest food and the best ingredients was instilled in her by her Italian grandmother and mother. After starting out in the kitchens at Aubergine, Zafferano and L’Oranger, Angela became head chef at Petrus after seven months, helping the restaurant gain a Michelin star. She went on to launch Amaryllis in Scotland, Verre in Dubai, and MENU and The Grill Room at The Connaught, with Gordon Ramsay. In 2007, Angela was awarded an MBE for services to the hospitality industry. The following year, she opened Murano in Mayfair, where she holds a Michelin star. 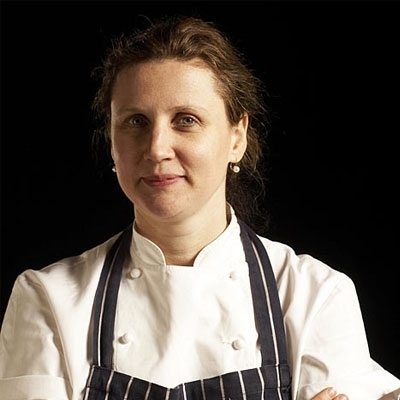 In 2012, Angela opened Hartnett Holder & Co in partnership with Robin Hutson and Luke Holder. In September 2013, she launched Merchants Tavern in Shoreditch with Neil Borthwick, and Canteen founders, Dominic Lake and Patrick Clayton-Malone. In November 2013, Angela opened Cafe Murano, a brassier little sister to Murano, where she creates the menu with Sam Williams. In June 2015, a second Cafe Murano opened in Covent Garden. Angela has two cookbooks to her name, ‘Cucina’ and ‘Angela’s Kitchen’. ''Jamie is 'the man', when it comes to raising awareness! Teaching people to cook and eat more healthily is a no-brainer for the nation's health.